This sensational stuffed pork chops recipe comes from a wonderful cookbook called Steak with Friends: At Home, with Rick Tramonto . 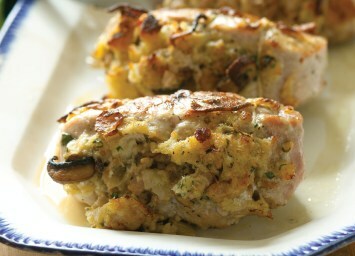 The pork chops are stuffed with a delicious mixture of mushrooms, Italian sausage, Parmesan cheese and sage. In a large bowl, toss the bread chunks with 1/2 cup of the olive oil and salt and pepper to taste. Spread on a baking sheet and toast in the oven, shaking the pan several times to insure even browning, for 5 to 6 minutes, until lightly browned. Let the bread cool for about 10 minutes, then transfer to a large bowl. In a large skillet, heat 2 tablespoons of the oil over medium heat. When hot, sauté the onion and garlic for about 3 minutes, or until the onion softens. Take care so the garlic does not burn. If it appears to be scorching, lower the heat. Add the sausage, sage, and marjoram and cook, stirring with a wooden spoon to break up the sausage meat, for about 10 minutes, or until the sausage is cooked through. Transfer to the bowl with the bread and set aside. Add 2 tablespoons of the oil to the skillet and heat over medium heat. When hot, add the mushrooms and cook, uncovered, for about 5 minutes, or until the mushrooms give off their juices, the juices evaporate, and the mushrooms begin to brown. Transfer the mushrooms to the mixing bowl. Add the Parmesan and parsley and mix well. Slowly add the stock, stirring to mix, and season to taste with salt and pepper. Cover the bowl and refrigerate until chilled. The stuffing can be made and refrigerated up to 2 days in advance. Meanwhile, prepare a clean, well-oiled charcoal or gas grill so that the charcoal is medium-hot or the heating elements are hot. Using a sharp knife, cut pockets into the chops by slicing horizontally into the thickest side, working the knife through the meat nearly to the other side. Wiggle the knife in the meat to make the pockets. Using your fingers or a spoon, stuff the pockets with the sausage mixture until overflowing. Tie the chops like a package with kitchen twine to hold the stuffing in place. 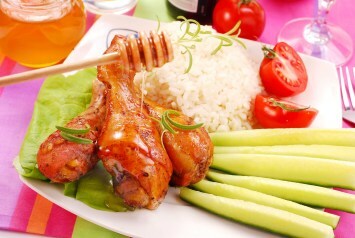 Rub both sides of the chops with the remaining 2 tablespoons olive oil and season well with salt and pepper. Grill the pork chops, turning once with tongs, for a total 10 to 15 minutes, until browned and cooked through. If you are not sure the meat is done, insert an instant-read thermometer into the stuffing; it should read 165°F. Remove the string, let the chops rest for about 5 minutes, and serve. Make sure the grill is very hot before putting the chops on the clean, well-oiled grilling grid. His hint? Make sure the grill is very hot before putting the chops on the clean, well-oiled grilling grid. This recipe for stuffed pork chops is just one of our amazing pork recipes. Find them all listed here.